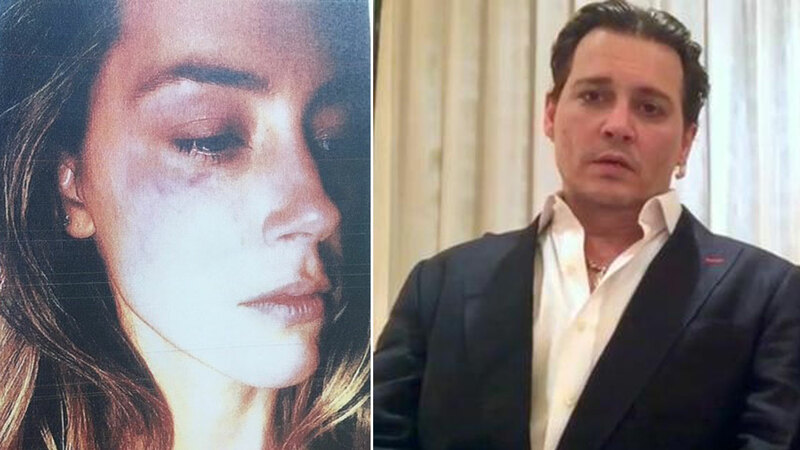 LOS ANGELES, CA -- A judge ordered Johnny Depp to stay away from estranged wife Amber Heard after she accused the Oscar-nominated actor of repeatedly hitting her during a recent fight and leaving her face bruised. Los Angeles police responded to Depp and Heard's residence on Saturday, but were asked by the person reporting domestic violence not to take a report and did not provide evidence. "Officers' investigation determined that a crime did not occur," Los Angeles police officer Aareon Jefferson said Friday. Heard's filing alleges a history of abuse throughout her relationship with Depp, which started after they met on the set of the 2011 film "The Rum Diary." The restraining order was issued on the day Depp's latest film, "Alice Through the Looking Glass," opens in theaters. A Walt Disney Pictures spokesman declined comment on Heard's allegations. Heard's filing Friday said the actor was high and drunk when Saturday's alleged abuse occurred. Heard's divorce filing cited irreconcilable differences and said the pair separated the day before. She is seeking spousal support from the "Pirates of the Caribbean" star, but Depp's response filed Wednesday asked a judge to deny the request.